iBwave, the standard for converged indoor network planning is happy to announce that WAV Inc, a value-added distributor of world-class wireless networking solutions has added the iBwave Wi-Fi® Suite to its product portfolio. iBwave’s Wi-Fi solution allows our integrator partners to provide a predictive analysis for complex networking and WLAN environments” Zach Hubeck, WAV’s VP of Sales and Marketing. As more and more networks are designed with multiple technologies such as Wi-Fi, DAS, Cellular and Public Safety. There is a growing need for high performance Wi Fi networks that are convergence ready. iBwave Wi-Fi® is the tool to help improve capacity optimization and design accuracy for high density venues that can save hours of time on key projects. Because of this partnership, iBwave’s Wi-Fi network design tool will be available to WAV’s customers as part of a complete converged network design solution. “We are excited to work with WAV as they bring our Wi-Fi solutions to their integrator partners” said Tirtho Deb, Director Enterprise Solutions at iBwave. “The iBwave Wi Fi® solution builds upon our extensive experience as the industry standard for in building wireless networks. As a result, it helps our enterprise customers to better plan, design and deploy Wi-Fi networks that are future proof and convergence ready” he added. Learn more about how the iBwave Wi-Fi® Suite, can help design cost effective carrier-grade networks. Register for a product demo. iBwave Solutions, the standard for converged indoor network planning is the power behind great in-building wireless experience, enabling billions of end users and devices to connect inside a wide range of venues. 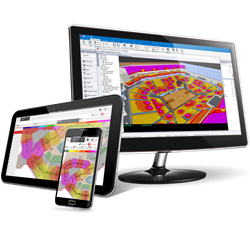 As the global industry reference, our software solutions allow for smarter planning, design and deployment of any project regardless of size, complexity or technology. Along with innovative software, we are recognized for world class support in 90 countries, industry’s most comprehensive components database and a well established certification program. For more information visit: ibwave.com.